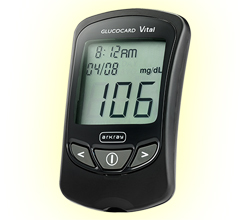 The GLUCOCARD Vital is everything a blood glucose meter should be - fast, accurate and easy to use. A small 0.5 µL sample size in our GO-based test strip platform gives accurate results in as little as 7 seconds. This auto coded meter has a 250-test memory, records 14- and 30-day averaging and is downloadable.